Amazon.com Price: $39.98 (as of 2019-04-22 02:45:20 GMT) Product prices and availability are accurate as of the date/time indicated and are subject to change. Any price and availability information displayed on Amazon.com at the time of purchase will apply to the purchase of this product. 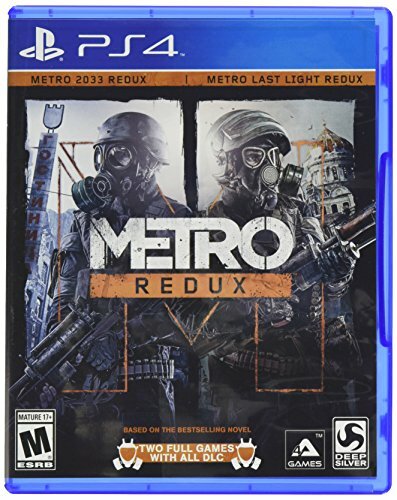 Metro Redux is the ultimate double game collection, including the definitive versions of both Metro 2033 and Metro: Last Light, each rebuilt in the latest and greatest iteration of the 4A Engine for next-gen consoles. For the first time, console owners can expect smooth 60FPS gameplay and state of the art visuals that were once only available on high-end PC hardware. Newcomers to the series will get the chance to experience two of the finest story-driven shooters of all time in one vast package; an epic adventure combining gripping survival horror, exploration and tactical combat and stealth. Fans of the original games will find the unique world of Metro transformed with incredible new lighting, physics and dynamic weather effects, as well as a host of gameplay improvements and new features.